So where is Billie living this year, anyway. Does the rest of Roomies! ever tell us? She’s not living with Ron and Carly anymore. Does she have a dorm room? Does she have her own place? Does she just live in Danny and Joe’s dorm room for forever? The author should not be asking these questions. 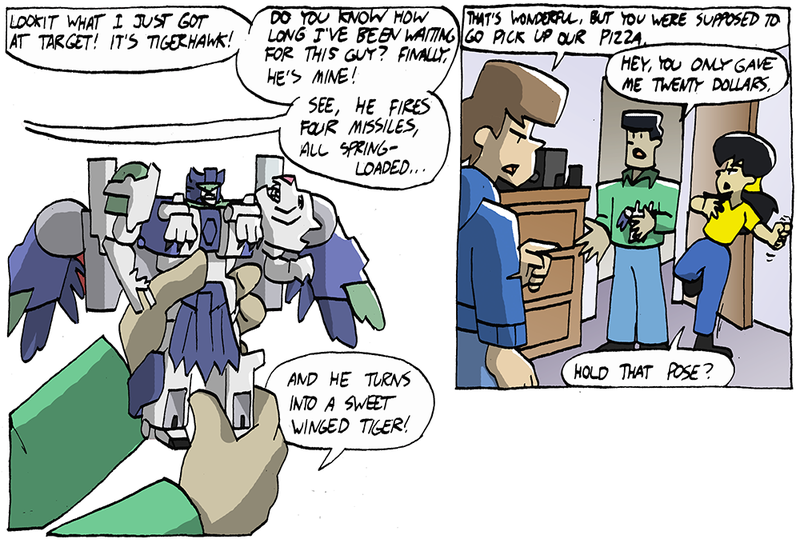 I was always upset because Tigerhawk and T2 Megatron were never sold in any of my local stores. At least, every time I went looking for them they weren’t there, which was annoying as all hell. Awww yeah, Tigerhawk. I’m not a huge TF guy, but I did love me some Beast Wars, and he was one of my favorites. And I always felt that the best Transformers were those whose names sounded like wicked rock bands. That’s why Starscream was always a personal favorite, you can practically hear the neo-classical guitar riffs when you think that name. But this was 1999, you need to scale for inflation. Even back in the late 90s? Actually, if there was a Cici’s, and they went out, that was easily under $20 for buffet AND drinks. At my college we had a Gumby’s Pizza that would sell a large single topping pizza for $5 some nights. Worst pizza I ever ate, so greasy that it passed through you without touching the sides, sometimes managed to be undercooked and charred on bits of the same slice. But it was $5 a pie, so you can bet I ate it constantly. Ohio State? I never liked Gumby’s either. Just checked their website, apparently there are only 10 Gumby’s in existence, and 9 of them are on college campuses. They sure know their clients; who but a penniless and probably drunk college kid would want that pizza? OSU’s seems to be gone, however. Shame, I have fond memories of walking High Street at 2 AM to acquire the Pizza of Shame. There is a weird dearth of pizza places around campus these days. If you’re willing to walk a few blocks south of campus, though, Late Night Slice kinda rocks. She’s still living with Ron and Carly. We’re a couple of months out from a brief arc where she moves out. I think she stays with Danny and Joe for a bit after that. Billie was kicked out of Ron and Carly’s apartment right after Ruth died. It’s why she lived with Danny and Joe for the last few months of spring semester. Yea, I think I am going to go with the author on this one. That arc they go to Ron and Carly’s to retrieve some of Billie’s stuff that’s still there, but she’s not living there. Carly wants Billie to move back in to help with rent, and I infer from some of the things said that Billie hadn’t even seen Ron and Carly since they kicked her out after Ruth’s death. Billie might have a dorm room assigned somewhere, or maybe she’s still got Ron and Carly’s listed as her official residence with the college, but if the former we never see her spend any time there, and if the latter she definitely isn’t actually living there. She seems to actually be living in Danny and Joe’s dorm room still. At least she’s spending all of her time there. So where is Billie living this year, anyway. Dunno, but Joe won’t be living at all if he actually holds that pose…. Also, wasnt Joe going to go to a school that had engineering as a major. That was one of the reasons for Danny’s moodiness before Ruth died. It was mentioned later that the school rejected him. He only applied for one school!? He made a hoverboard out of a pingpong table! The author should be asking these questions. Just. Y’know. Before. …and now I feel very old, ’cause I can remember Tigerhawk being on the shelf… and being an adult, too. I was always under the impression that she continued to squat in Danny and Joe’s dorm room during the last year. I’d assume Billy got her own room. Is her dad still loaded and buying her love with cash? Somehow I keep forgetting that she’s loaded =o I guess “Stealth Wealth” wouldn’t be if it was obvious, though? On the down side, she’s living in her car; on the upside, it’s 2br/1b.